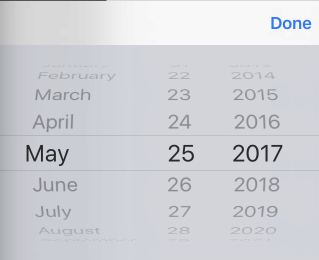 How to set date in Date picker on iOS? Repl crashes on attempt to get the tree but I use the following query q => q.Class("UIDatePicker") for this element. ----> System.Exception : Invoking an iOS selector requires either 0 or an uneven number of arguments (they have to match up pairwise including method name). @DarshanJS, but I need to set date from the test without the access to app source code. Try the following. I got this elsewhere but have not yet tried. This sets the complete time at once.